Spanning central Asia, the Tian Shan belt is one of the world’s most prolific gold belts. Having produced behemoth gold mines such as Rio Tinto’s Oyu Tolgoi copper-gold mine in Southeast Mongolia and the world’s largest open pit gold mine, Uzbek state-owned Muruntau, Erdene Resource Development is banking on advancing the belt’s next world-leading gold deposit in Southwestern Mongolia. With two major discoveries in Bayan Khundii and Altan Nar producing what CEO Peter Akerley describes as ‘some of the world’s best drilling intercepts’ in the last year there is ample evidence to suggest Erdene may be on the verge of joining the biggest players on the global gold scene.When Akerley arrived in Mongolia in 1997 the country was transitioning into a free-market democracy following the fall of communism, opening the doors to foreign investment and riding the wave of extreme growth in China. Aside from some Mongolia-Russian exploration teams, Mongolia was essentially closed for mineral exploration during the communist years, Akerley noted. In 2004 Akerley identified a perfect storm to start a company and begin exploring the remote country under the Erdene banner, zeroing in on Mongolia’s Southwest – which is less explored than the central and Eastern regions – in the late 2000s. The company has been one of the most active foreign explorers since then, having sifted through thousands of prospects, the whole while keeping its eye on the prize of finding a large gold deposit. Erdene’s meticulous exploration programme over the past two decades has finally delivered two discoveries that validate the time and expenditure. Both Bayan Khundii (Rich valley) and Altan Nar (Golden Sun), only 16 kilometres apart, have continually produced drilling intercepts far above the global average of around 1 g/t gold (Au). Bayan Khundii in May returned grades of up to 80m of 6 g/t Au and at Altan Nar in December the company hit 110m at 9.2 g/t Au. Akerley describes these grades at surface as globally unique, and while the grades are excellent the real boon for the project is the, as yet, unknown size of the deposits. Erdene closed an oversubscribed $13.8 million bought deal financing in late February and shortly after announced a 24,000m drilling programme focused on defining the size potential of its gold projects. Mostly, the work will be dedicated to drilling out Bayan Khundii followed up with drilling at Altan Nar and at a neighbouring, third gold project. The drilling programme at Bayan Khundii will focus on identifying perimeters of the deposit and also infill drilling in areas where Erdene has already focused. If, by the end of 2017, Erdene is still uncovering new areas of mineralisation a resource estimate will be postponed until a true understanding of the sheer size of the deposit is defined. Altan Nar will involve a more protracted exploration process. It’s a large system, with 18 targets identified over a 5.6km trend with only two near surface targets drilled so far. Further exploration there will be pursued in mid-2017, and depending on results could transition into a much a larger drill programme. Mongolia may seem like a distant and remote location, a region of raw wilderness covered in mountains and sweeping deserts, nestled between Russia and China. But Akerley says thanks to initiatives led by the Mongolian Government to drive foreign investment and international mining activity the country is far more accessible in today’s world. It has worked to create an environment where international companies feel safe and protected investing and working in Mongolia, culminating in recent foreign investment protection agreements with the US & Canada allowing more transparency and tackling dispute resolution and expropriation. With a tranche of mining business taking place in this area of Mongolia there is strong localised infrastructure that Erdene can lean on. The project is located just 200km from one of Southern Mongolia’s major new resources centres, mainly focused on coal production, but encompassing all the required infrastructural developments for resource production. China has built up rail lines to the border to access Mongolia’s commodities and has in turn unlocked a major source of mining equipment. On the Mongolia side there is a growing local labour force of equipment operators and mine support workers. Mining in Mongolia today accounts for about 20% of the country’s GDP, and that is expected to rise to over 30% in the next decade. “So we are well located to a centre that provides key infrastructure, support, labour and services,” notes Akerley. As the company advances its gold projects it has staffed up its management and board of directors accordingly, including the recent addition of Dr. Anna Biolik, Canada’s first resident Ambassador to Mongolia, and one of the foremost Canadian experts on Central Asian business and diplomacy. Of equal excitement to the projects themselves is the district scale potential these discoveries bring to the table. The Tian Shan belt is one of the world’s most prolific areas for major gold discoveries. There are multiple 5+ million ounce deposits spread across central Asia, it is vastly prospective and fertile. The area Erdene is focused on was unexplored until the company arrived and Akerley is hoping the company has discovered a significant gold trend with Bayan Khundii and Altan Nar representing the tip of the iceberg. In that vein Erdene structured an agreement with Canadian mining giant Teck Resources to continue exploration in the area, excluding the three gold deposits already discovered, which will remain 100% Erdene. The alliance with Teck allows Erdene to keep its shareholders exposed to the upside of regional copper-gold exploration within a 400 km trend of the highly prospective mineral belt while being able to lean on Teck for funds to carry out the exploration. Ultimately, if Erdene comes across a deposit that Teck wants to pursue the Canadian major has an option to earn-in 75% by funding the first years of exploration. Akerley says it is a relationship that suits Erdene perfectly. At the moment, that regional exploration programme is happening alongside Erdene’s exploration push at Bayan Khundii and Altan Nar as it moves both projects to the resource estimate stage. Depending on the continued success of the 2017 drill programme that resource estimate will happen between the end of this year and the middle of 2018. 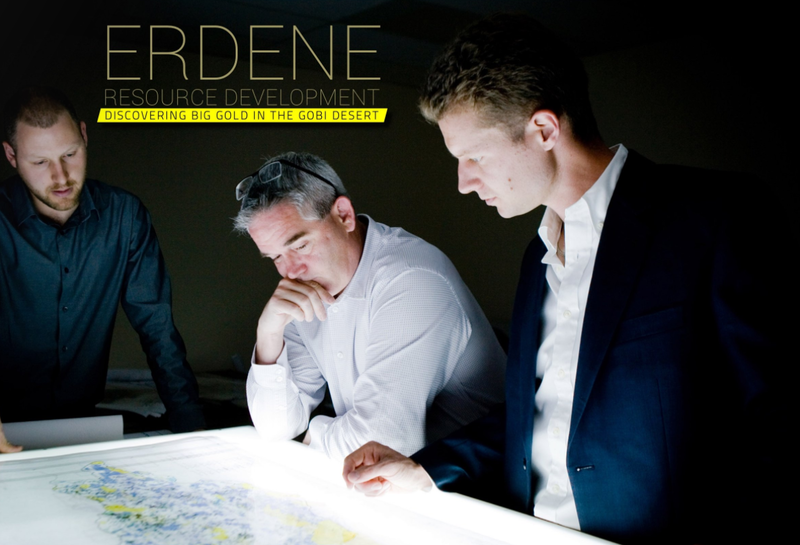 Erdene has entered 2017 with a very strong cash position to complement what it considers to be the highest quality portfolio of mineral projects amassed in the company’s history. “The underlying story is the unknown of how big these gold systems might be and that question can’t be answered until we get through a significant amount of drilling,” says Akerley.